I am going through the design of hydraulic steel draft tube gate for power house. 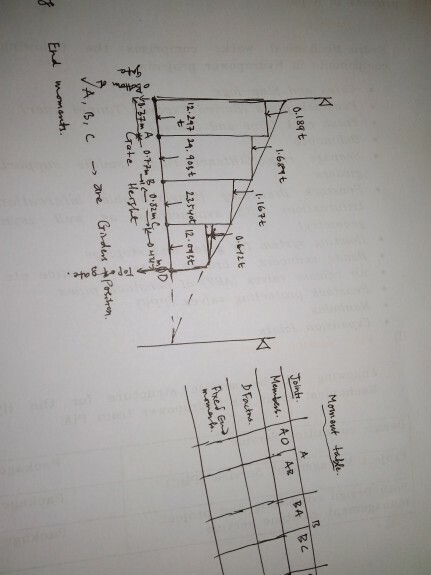 i calculated the loading diagram and located the position of horizontal girders and gate leaf plan etc. For sizing the girders, i came across the problem on solving the problems by moment distribution methods (many prefer this methods).But i am quite in doubt in using this methods. I have attached my diagrams. Kindly suggest me the way i should approach to solve this. Moment distribution is quite simple, but would take a lot of steps (with consequent loss of accuracy) for multiple spans. I'd not do it today for more than 3 spans. Why not use a frame analysis program like STAAD / SAP instead? But have only 3 girders in the gate frame and for sizing i need to solve this to get the load on positioned girders. the manual calculations much be appreciated.